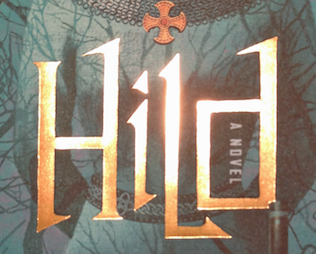 I’ve just got back from the Pacific Northwest Booksellers Association trade show in Portland where I gave a presentation about Hild. Well, presentation is what the organisers called it. I called it waving my hands about and rabbiting on about Hild the woman (why she’s so intriguing, why I spent years living with her and plan to spend years more) while everyone else munched on eggs and ham, or muffins and muesli, or whatever. I’ve never given a breakfast speech before. After dinner speeches, yep, when everyone’s mellow with wine and rich food. It was rather odd to be faced with a sea of alert, brilliantly lit faces at the ungodly hour of 8:00 a.m. But it was good to meet so many booksellers–people from Alaska and Montana and Idaho as well as the usual Washington State folks. And the other three authors–Elizabeth George, Cynthia Voigt, and Brandon Sanderson–were interesting. They’d all clearly done this kind of thing before. Everyone’s style was pretty different. But the booksellers seemed pleased with our efforts. I’m glad it went okay because they’re a great group of people. After the breakfast, I wandered about the exhibit hall saying hello. If I had any expectations it was probably Book Expo America in miniature, but it was much more like an SF convention. People nodding as you go by, some punters with odd social skills, idiosyncratic wares on display. In the bar people were shouting, and beaming and throwing open their arms: Hey! Haven’t seen you since last year! Above all, there was the same sense of community I find at a regional or speciality con: WisCon or Westercon or World Fantasy. It was fantastic (in all senses of the word). And I got to meet people I’d only talked to through Twitter, like Colleen Mondor of Bookslut (and author of fab books about flying in Alaska). If you’re an author, I can recommend it wholeheartedly. If you’re a bookseller, why weren’t you there? I also really liked the fact that the mood was buoyant. The doom and gloom of other bookseller meetings was not in evidence. My sense is that independents are beginning to get a handle on the new bookselling landscape. It bodes well. But perhaps the most amazing thing for me was seeing on Sunday evening the giant wall of Hild I was supposed to sign. (150? 200?) I tell you, seeing one is fabulous, but seeing hundreds was incredible. It is, hands down, the handsomest book I’ve ever clapped eyes on. I signed books single-mindedly for a while, going into author-machine mode, signing them all exactly the same. 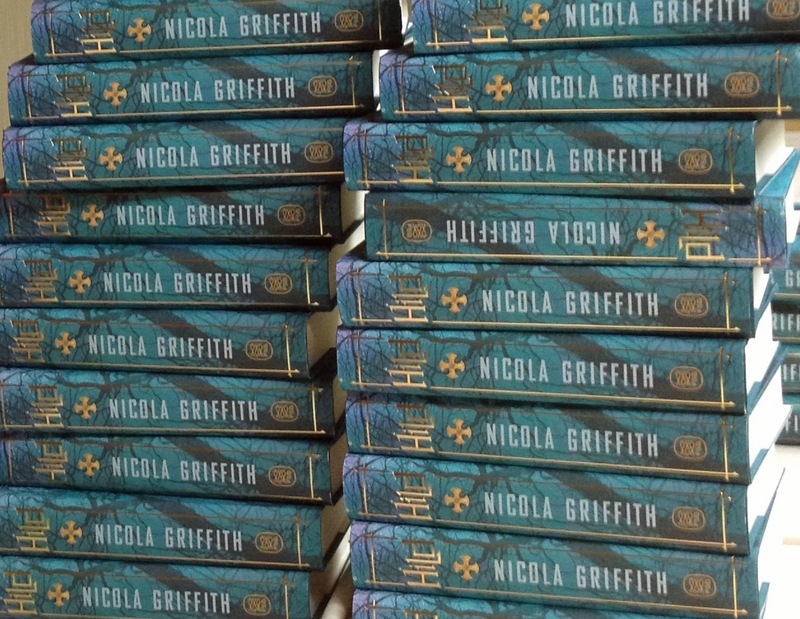 Except, er, two, which I signed N Griffith rather than Nicola Griffith. (I went into business mode rather than Author Mode.) 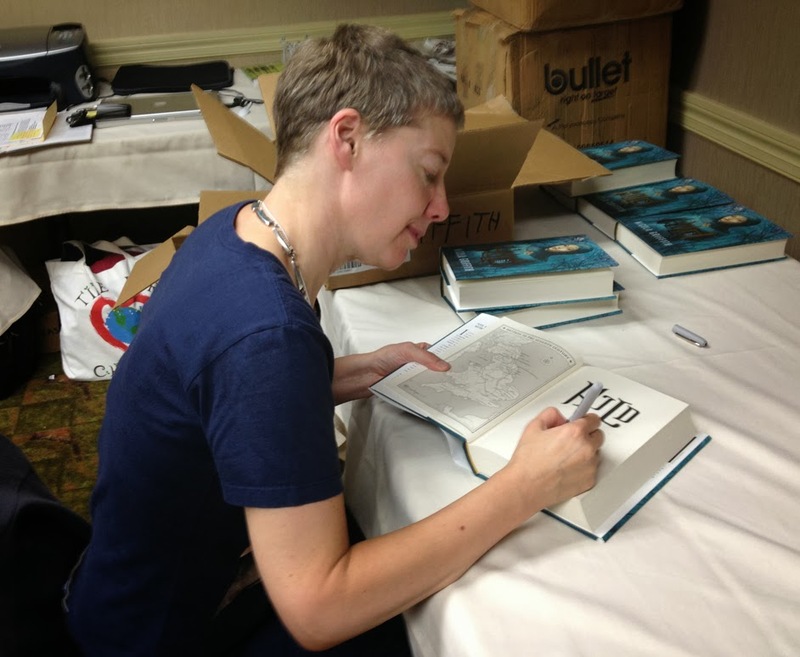 Kelley took a picture for posterity: the very first time I signed a finished copy of Hild. And because I can’t resist, here’s a closeup of the finished book. See how luscious all that debossed gold is! I'm so glad you had fun. I'm also glad there are still books and book sellers. But how did you get your mind to work at 8:00 am? So glad you had such a good time! It was great to meet so many enthusiastic and upbeat booksellers.